Lancashire captain Dane Vilas gave credit to Nottinghamshire Outlaws after they defeated the Lightning at Trent Bridge last night. Nottinghamshire had recovered from losing four wickets inside the first six overs to post 196-9 thanks to 44 from Jake Libby and 40 for Billy Root. Then, after rain had intervened, Lancashire’s target was amended to 156 from 15 overs, only for their reply to end with the Red Rose on 139-8. Vilas said: “The rain break came at an unfortunate time because we had some momentum but credit to them, how they played. “We wanted to show some intent and get the first punch in (after the restart) but Samit (Patel) got a wicket and then it was two in two balls. “We’re disappointed but it was a great game of cricket. It was nice that we got back on for that great crowd and a great game. 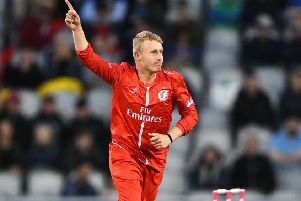 Lancashire’s task was made harder thanks to the unavailability of England star Jos Buttler and injured skipper Liam Livingstone. “Two massive players – Jos one of the best in the world and Livi has just won two man of the matches,” the stand-in skipper acknowledged.